The R100 rower is a serious rowing machine and the main contender in our view to challenge the crown of the ever popular Concept2 Model E. So what do you get for the price? A heck of a lot! The first impression you get when you sit on the R100 is that it's a solid machine, and we mean solid. The aluminium frame and solid steel supports give a rock solid feel and Lifecore claim it will handle a user of up to 600 lbs! That's no mean feat in our book and as far as we know, no other rower comes close in the sturdy stakes. The seat is very comfortable even after 30 minutes, and it slides smoothly and quietly up and down the track. The range of resistance (uses both air and magnets for a varied experience) will be wide enough for anyone - you can row fast and free or ramp up the levels and really work those muscles with a short, hard burst. 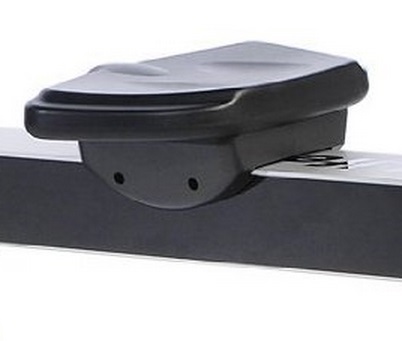 The magnetic resistance mechanism also means the rower can adjust to your heart rate without you needing to stop and do it manually - see heart rate programs. This really means you get the best workout possible - even if you've only got 10 minutes to train. Many types of fitness equipment now offer heart rate training programs and the science makes sense. If you can keep your heart beating at a specific percentage of your maximum heart rate (MHR), then you'll get more from shorter sessions than longer, slower workouts. The ergonomics of this machine are great and will suit all sizes. 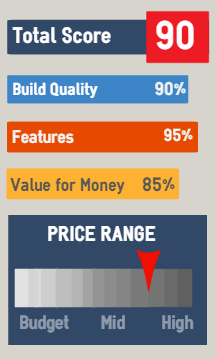 Our reviewers ranged from 60" to 76" and all found it comfortable and a joy to use. The tilting foot rests also help you get the best, most efficient technique ensuring you can work you buns off without straining your lower back. 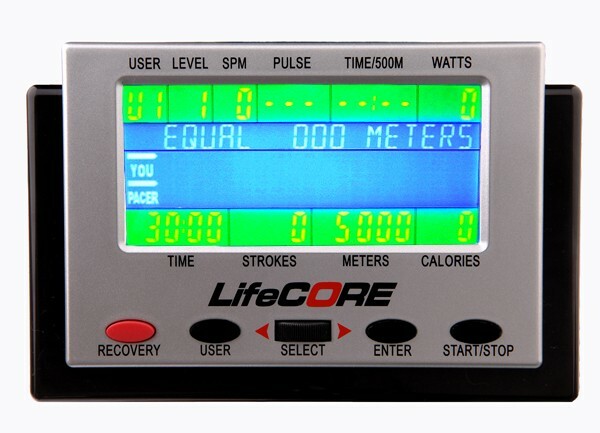 In our view the console/ display on the Lifecore is superior to the Concept2's PM5. It's larger, easier to read and has some great preset programs. Although, it doesn't have online functions like the Concept2. Our favorites are the heart-rate programs (mentioned above) that will alter the resistance or increase your target stroke rate to keep your heart pumping at the optimum level for weight loss or improving your fitness. The biggest factor in getting the most from your rowing machine is motivation; if you don't use it you won't get into shape! So anything that keeps you coming back is a big plus. The variation of the programs on the R100 will do just that. It will also keep a record of your past performances so you can see your progress and race against yourself - it will store data for up to four people. 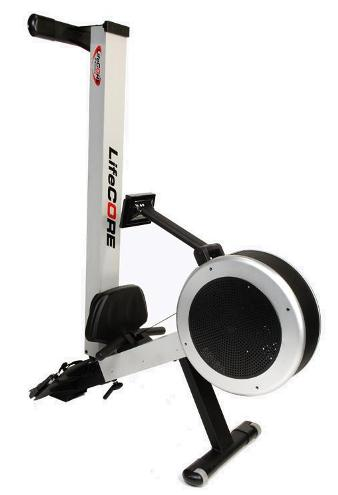 Yes, off course it's a lot to pay for a rowing machine - but when you consider that one built as well as this with all its features will keep you fit and in shape for the years to come - it's not a bad return on your investment. If other family members are going to row then it's an excellent purchase. There are very few rowers that can match the Concept2, but the majority of us here think the R100 comes pretty close with some actually putting this one ahead. The price - but then you get what you pay for and it will last for years! Yet to find anything else we don't like about this rower. 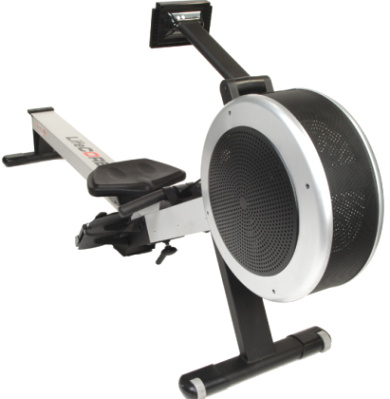 92" x 19" x 36"
52" x 19" x 67"
The R100 is a serious contender to the best selling Concept2 Model E's crown. If you have a few hundred bucks to spare, checkout the VR500 from Bodycraft with its great selection of programs and some innovative features. Update from Skip after 7 months: October 2015: "Other than two minor issues with the HRM (possible interference from WiFi) and dust getting into the seat rollers, this machine been completely trouble free. I really enjoy supplementing my training by rowing. I expect this machine to endure many years of use."